Been looking forward to forward to talking to Sean Lowe for a while now, and this almost 2 hour conversation definitely didn’t disappoint. A lot to cover (and certainly some stuff we never got to) in this podcast, that I basically broke down into 4 parts: the Vouch dating app that started this week, his time on Emily’s season of the “Bachelorette,” his season of the “Bachelor,” and his post-“Bachelor” TV life & fatherhood. Sean has been doing media for 5 years now, including having written a book, so if you’ve followed him extensively, you may have already heard some of these stories, but I really hadn’t, so it was good to get some clarification on things that have happened to him on his journey throughout this franchise. Especially liked the story he told about how my name came up by production during his filming of Emily’s season while they were in Curacao. As always, if you’d like to respond to the interview, please include Sean’s Twitter handle (@SeanLowe09) in your replies so he can see them. I think you’re gonna like this one. I appreciate Sean giving me this much time and being so candid about his time on the show and post-Bachelor life. Hope you enjoy it as well. (SPOILERS) Sean joins me to talk about Vouch, the new dating app venture he’s gotten involved in (6:37), the reason he initially agreed to go on the show (16:29), did he think Emily was picking him when it was down to final 3 (22:25), if she did, does he think they would’ve lasted (26:27), how soon after the breakup was the Bachelor brought up to him (30:15), did he have any pre-show demands before signing on (34:40), being labeled the Virgin Bachelor by the media (42:10), Catherine getting a bizarre edit and being “hidden” (45:40), thoughts on Tierra (49:40), being pranked by Des and dealing with her brother (54:14), being confronted by AshLee Frazier at the WTA (58:17), his private talk with Catherine the night before the final rose ceremony (1:01:34), his post-show TV career starting with DWTS (1:11:23), the decisions to do Celebrity Wife Swap and Celebrity Marriage Boot Camp (1:19:12), co-hosting “After Paradise” for a season (1:30:51), fatherhood & work life now (1:34:51), and we end with the Final 10 (1:38:50). 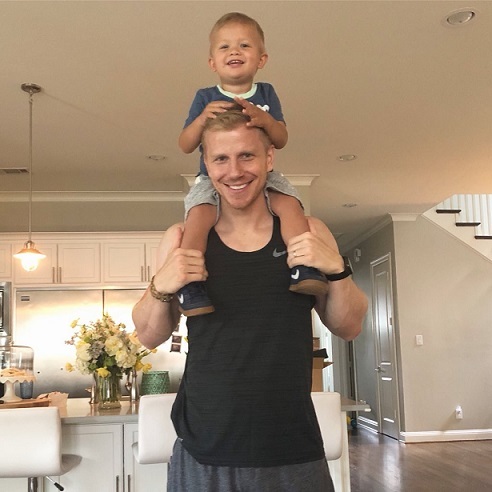 I simply adore Sean Lowe. Hands down my favorite person in this entire franchise. So well spoken in every way, just a class act. Even doing the lame sell-out crap like Marriage bootcamp for a quick payday didn’t tarnish his image in my eyes, I still really enjoy watching him and Catherine. (And their oldest son Samuel is like the boy version of my daughter looks-wise, same age too, just one month older hehe) Wish them tons of success. I enjoyed this podcast because I’m a big fan of Sean and Catherine. I agree with the above comments… he is a class act. I have to say that I think it’s pretty lame when Bachelor/ette people go on those awful Marriage Boot Camp and Wife Swap shows, but listening to Sean talk about it made me realize that it’s a way to make a lot of money in a short amount of time. Kinda hard to pass up on that. Now I want to go back and watch his season again. Yeah at least he admits it was mistake to do those shows. I guess if you’re given that kind of monetary offer, it would be hard to pass on. I love them as a couple! He said in his book that it was Catherine’s decision to become a Christian after they fell in love and I guess she even sings at their church too! I live in the suburbs between Ft. Worth and Dallas. I wonder what church they attend. I loved their TV wedding and his Dad and how much they love and adore Catherine as part of their family. And gosh Samuel sure is a cute kid! He looks just like his daddy! Tinyred500, you are right about Sean’s reluctance to badmouth this franchise. He and Catherine have both stated that television has been good to them and that they don’t want to bite the hand that feeds them. They are grateful for the financial support that those opportunities provided. I forgot how much I love Sean. What a sincere honest man. Best bachelor ever! GoingBlonde…. I follow them on Instagram and twitter and occasionally they post a picture outside of their church. I think its Fellowship Church in Dallas. I really want to read his book now. I remember that Catherine wasn’t portrayed as a Christian on the Bachelor, and I often wondered if that was created for drama or if she converted. I got that question answered here, but it made me want to read his book.